This week Sunni and Shia Muslims ushered in the Islamic New Year and the beginning of the holy month of Muharram. For Shias, the month also is a time to mourn the events that sparked the centuries-old schism between Shia and Sunni Muslims.1 Pew Research Center polls conducted in 2011-2012 find high levels of concern about sectarian tensions in several countries where Sunnis and Shias live side by side. These concerns are particularly pronounced in Lebanon, where fully two-thirds of all Muslims, including about half of Shias and 80% of Sunnis, say sectarian tensions are a very big or moderately big problem. 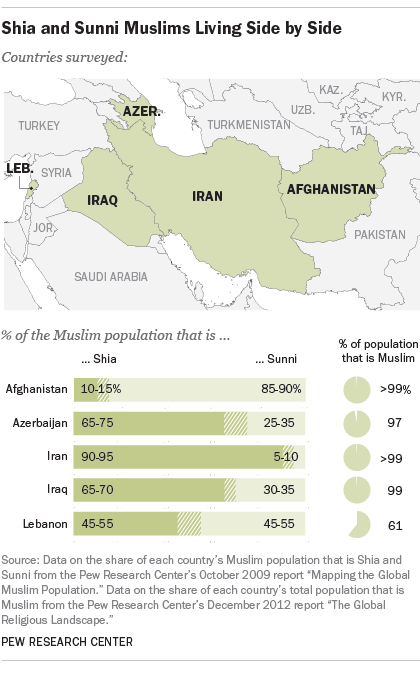 Roughly half of all Muslims in Iraq, more than four-in-ten in Afghanistan and nearly a quarter in Iran say the same. In addition to concerns about sectarian tensions, concerns about religious extremism in general also are widespread in the countries surveyed, with about two-thirds of all Muslims in Iraq and Afghanistan, half of all Muslims in Lebanon and roughly a quarter of all Muslims in Iran expressing worry about radical religious groups. However, when members of the two sects are compared, Shias tend to express less concern than Sunnis about extremist groups, despite the fact that Shias are a minority among Muslims globally and often have been targets of religious violence. 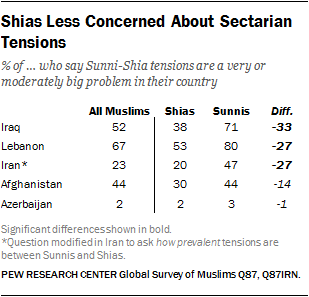 Similarly, Shias are less likely than Sunnis to say that tensions between the two sects are a major problem in their country. The polls also show that concerns about religious tensions do not always go hand-in-hand with perceptions of religious freedom. In Lebanon, for example, the vast majority of both Shias and Sunnis describe themselves as very free to practice their faith, even though many express concern about sectarian tensions and religious extremism. With regard to religious beliefs and practices, the polls find that majorities of Shia and Sunni Muslims share key tenets of the Islamic faith, including belief in one God and the Prophet Muhammad, belief in heaven and hell, and observance of fasting during Ramadan. In addition, within individual countries, Shia and Sunni Muslims tend to exhibit similar levels of religious commitment. While Shias and Sunnis are united by many beliefs and practices, however, they differ substantially in their attitudes toward certain rituals commonly practiced by Shias during Muharram. On the 10th day of Muharram, Shias commemorate the death of the Prophet Muhammad’s grandson, Hussein, by making pilgrimages to holy shrines. The polls show that visits to shrines are nearly universally accepted by Shias, while Sunnis are significantly less likely to say it is permissible in Islam to visit the shrines of saints. In four of the five countries surveyed, sizable percentages of both Shias and Sunnis are concerned about sectarian conflict. Two-thirds of all Muslims in Lebanon describe sectarian tensions as a very big or moderately big problem in their country. Roughly half of Muslims in Iraq (52%) share this assessment, as do more than four-in-ten in Afghanistan (44%) and nearly a quarter (23%) in Iran. However, Shias and Sunnis sometimes differ on how big a problem sectarian tensions pose in their country. 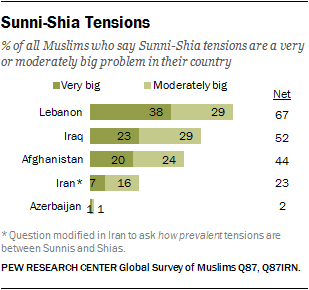 In Iraq, for example, Shias are 33 percentage points less likely than Sunnis to say that tensions between the sects are a very big or moderately big problem. Similarly, in both Lebanon and Iran, Shias are 27 points less likely than Sunnis to see sectarian conflict as a major problem. But Shias and Sunnis in Afghanistan do not differ significantly in their assessments of sectarian tensions. And in Azerbaijan, few Muslims –either Shias or Sunnis – see sectarian conflict as a major problem. Substantial percentages of Muslims in four of the five countries surveyed say they are very or somewhat concerned about religious extremism. Half or more are worried about extremist groups in Iraq (68%), Afghanistan (64%) and Lebanon (50%), while more than a quarter say the same in Iran (28%). In Azerbaijan, by contrast, fewer than one-in-ten Muslims (6%) indicate they are concerned about religious extremism. Within individual countries, Shia and Sunni Muslims do not always share the same level of concern about extremist groups. The gap is particularly wide in Lebanon, where Shias are 32 percentage points less likely than Sunnis to say they are very or somewhat concerned about religious extremism. 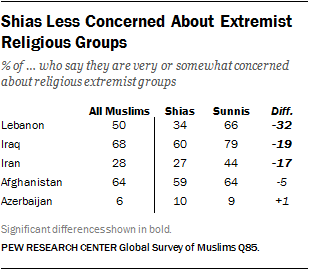 Shias also are significantly less worried about extremist groups in Iraq (-19 points) and Iran (-17). By contrast, the two sects share similar levels of concern in Afghanistan and Azerbaijan. In four of the five countries where substantial numbers of Shias and Sunnis were surveyed, most Muslims say they are very free to practice their faith. But only about half (48%) of all Muslims in Iraq – including 58% of Iraqi Shias and 42% of Iraqi Sunnis – describe themselves as very free to practice their religion. Perhaps not surprisingly, in the three countries where Shias are clearly in the majority – Iran, Iraq and Azerbaijan – Shias are much more likely than Sunnis to say they are very free to practice their faith. The biggest difference is in Iran, where Shia Muslims are twice as likely as Sunnis to feel that they are very free religiously (88% vs. 44%). In Lebanon, by contrast, fully 90% of both Sunnis and Shias describe themselves as very free to practice their faith. When it comes to religious beliefs and practices, the surveys reveal that Shias and Sunnis are united by key tenets or articles of the Islamic faith – beginning with the fundamental belief in God and His Prophet Muhammad.5 In all five countries surveyed, Shias and Sunnis nearly unanimously say they believe in God and the Prophet Muhammad. Belief in life after death – another core belief in Islam – is very high among both Shias and Sunnis, with roughly nine-in-ten or more in each of the countries surveyed agreeing there is a heaven and hell.6 Only in Iraq are Shias somewhat less likely than Sunnis to believe in hell (89% vs. 98%, respectively). Belief in angels and predestination represent two other central articles of faith in Islam. In the five countries surveyed, overwhelming majorities of Shias and Sunnis say they believe in angels and predestination. There are not significant differences by sect in attitudes toward these core tenets of Islam in any of the five countries surveyed. Unlike belief in key articles of the Islamic faith, personal religious commitment widely varies among the publics surveyed. This variation is primarily from country to country; within individual countries, Shias and Sunnis tend to report similar levels of religious commitment. 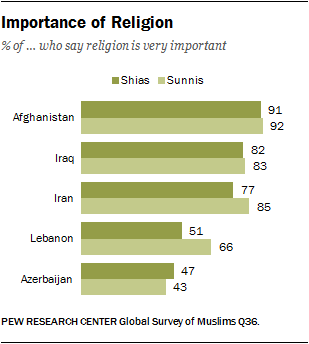 In Afghanistan, Iraq and Iran, for example, at least three-quarters of Shias and Sunnis say religion is very important to them, with no significant differences between the sects. In Azerbaijan, too, Shias and Sunnis share a similar view of religion, with just under half in each group (47% and 43%, respectively) saying religion is very important in their lives. Only in Lebanon do the two sects differ significantly over the importance of religion: 66% of Lebanese Sunnis say religion is very important, compared with 51% of Lebanese Shias. When it comes to fasting during the holy month of Ramadan – a central pillar of Islam – there is, again, substantial variation between countries but little discernible difference between Shias and Sunnis within each country. In Iraq, Afghanistan, Lebanon and Iran, for instance, more than eight-in-ten members of both sects say they fast during Ramadan. In Azerbaijan, by contrast, fewer than half of either Shias (48%) or Sunnis (42%) report that they observe the traditional fast during daylight hours throughout the month. 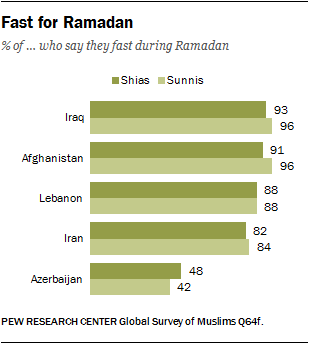 In none of the countries surveyed are either Shia or Sunni Muslims significantly more observant of the Ramadan fast. Within each country, the survey also finds, Shias and Sunnis tend to pray and attend mosque at similar rates. Indeed, only in Afghanistan is there a significant difference between the sects: Afghan Shias are 15 percentage points less likely than Afghan Sunnis to say they pray several times a day (77% vs. 92%). Elsewhere, Shias and Sunnis in all the countries surveyed closely resemble one another in frequency of prayer and mosque attendance. The veneration of saints is one practice that often distinguishes Shias from Sunnis in the countries polled. 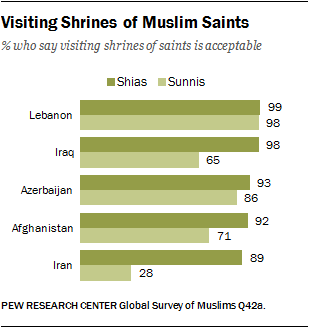 In Iran, for example, roughly nine-in-ten Shias (89%) say it is acceptable in Islam to visit the shrines of Muslim saints, compared with barely three-in-ten Sunnis (28%) who say the same. Shias in Iraq and Afghanistan also are much more likely than their Sunni compatriots to describe pilgrimages to saints’ tombs as an accepted Muslim practice (+33 and +21 percentage points, respectively). By contrast, the gap in Shia and Sunni attitudes is smaller in Azerbaijan (+7 percentage points) and nearly nonexistent in Lebanon, where both Shia and Sunni Muslims nearly universally say pilgrimages to the tombs of Muslim saints are acceptable. 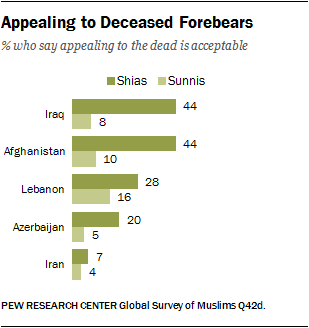 In all five countries, fewer than half of both Shia and Sunni Muslims say that Islam permits appealing to dead relatives or ancestors for aid. However, Shias are significantly more likely than Sunnis to accept this practice. The gaps are largest in Iraq (+36) and Afghanistan (+34), while significant differences are also found in Azerbaijan (+15) and Lebanon (+12). Only in Iran is there virtually no difference in Shia and Sunni attitudes toward appealing to deceased relatives or forebears. Results for the survey are based on face-to-face interviews conducted under the direction of Opinion Research Business in Iran and Iraq and Princeton Survey Research Associates International in the other three countries. Findings are reported exclusively for Muslims; however, the survey is based on national samples that did not screen out non-Muslims. In certain instances, regions of countries with high levels of insecurity or limited access were excluded from the national samples. In all countries, surveys were administered through face-to-face interviews conducted at a respondent’s place of residence. All samples are based on area probability designs, which typically entailed proportional stratification by region and urbanity, selection of primary sampling units (PSUs) proportional to population size, and random selection of secondary and tertiary sampling units within PSUs. Interview teams were assigned to designated random routes at the block or street level and followed predetermined skip patterns when contacting households. Within households, adult respondents were randomly selected by enumerating all adults in the household using a Kish grid or selecting the adult with the most recent birthday. The questionnaire was designed by the staff of the Pew Research Center’s Religion & Public Life Project in consultation with subject matter experts and advisers to the project. The questionnaire was translated into the vernacular language(s) of each country, checked through back-translation and pre-tested prior to fieldwork. Conducting opinion polls in diverse societies necessitates adapting the survey to local sensitivities. In some countries, pre-test results indicated the need to suppress certain questions to avoid offending respondents and/or risking the security of the interviewers. In other countries, interviewers considered some questions too sensitive to pre-test. Thus, not all questions were asked in all countries. Surveying in Iran presents special challenges, owing in part to U.S. government restrictions on the import and export of goods and services to and from the country. In conducting its survey of Iranian public opinion, Pew Research fully complied with the requirements mandated by the U.S. Government’s Office of Foreign Assets Control (OFAC). For results based on the Muslim sample in the countries surveyed, one can say with 95% confidence that the error attributable to collecting data from some, rather than all, members of the Muslim population is plus or minus the margin of error. This means that in 95 out of 100 samples of the same size and type, the results obtained would vary by no more than plus or minus the margin of error for the country in question. Please note that margins of error for sub-populations, such as Sunni and Shia Muslims, are larger than that for the overall Muslim populations surveyed. In addition to sampling error, one should bear in mind that question wording and practical difficulties in conducting surveys can introduce error or bias into the findings of opinion polls. It should also be noted that the sample was disproportionately male in Afghanistan. Sample design: Stratified area probability sample of all 34 Afghan provinces (excluding nomadic populations) proportional to population size and urban/rural population. Representative: Nationally representative of 94% of the adult population. Karabakh, Nakhchivan and Kalbacar-Lacin) and city of Baku proportional to population size and urban/rural population. Representative: Nationally representative of 85% of the adult population. Sample design: Stratified area probability sample of all nine main regions proportional to population size and urban/rural population. Languages: Farsi (Persian), Kurdish, Turkish, Gilaki, Baloch, Luri and Arabic. Representative: Nationally representative of the adult population. Sample design: Stratified area probability sample of all 18 governorates proportional to population size and urban/rural population. Beirut controlled by a militia group and a few villages in the south near the border with Israel) proportional to population size and urban/rural population. Representative: Nationally representative of 98% of the adult population.